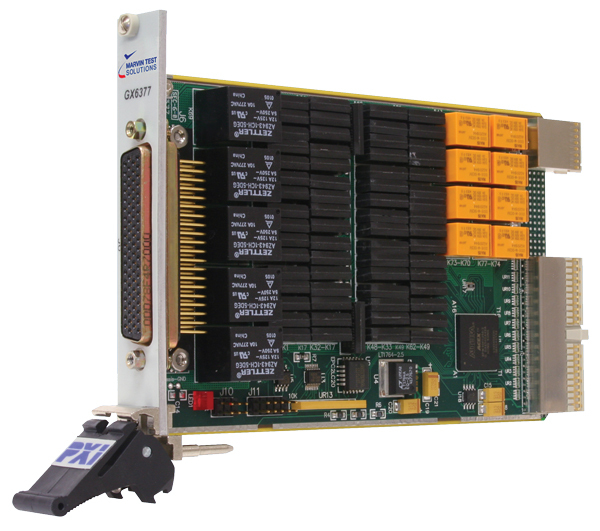 PXI Switching, Multi Function Card - GX6377 | Marvin Test Solutions, Inc. The GX6377 3U PXI multi function switch card provides users with the ability to switch both high current and general-purpose signals using only one 3U PXI switch module. The card features multiple channels of high current switching capability for 10 A and 2 A applications as well as two, 16 x 2 switch matrix groups, which can also be configured as a 32 x 2 or 16 x 4 matrix. The GX6377 offers a total of 3 high current, independent relays — five 10 A, Form A; four 2 A, Form A; and four 2 A, Form C. The dual 16 x 2 relay matrix is rated for 500 mA and is hardware configurable as a 16 x 4 matrix or software configurable as a 32 x 2 matrix.